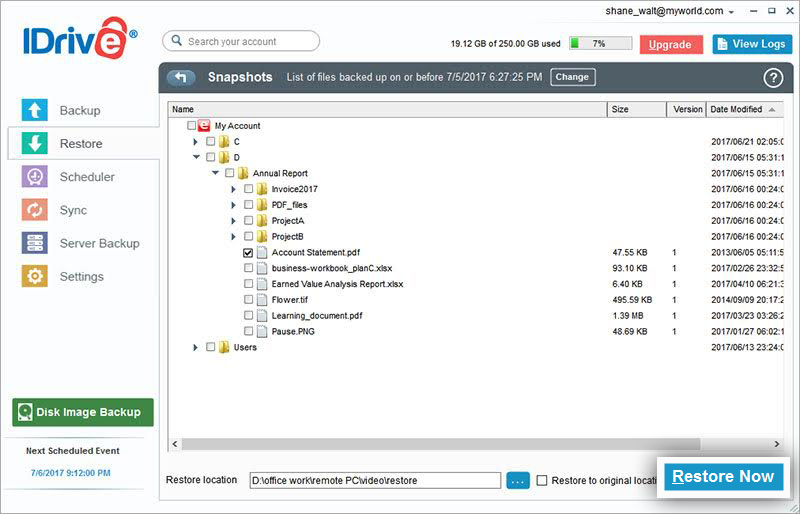 IDrive® Snapshots - Protect your data against ransomware! Encryption-based ransomware is getting more and more sophisticated and may not be detected by anti-malware software in time. Once infected, you will be locked out from your own data, with no guarantee that your data can be retrieved even after paying the ransom. Take advantage of IDrive Snapshots feature to make sure that you can restore versions of the backed up files, to a time prior to infection. Snapshots are historical view of your data, stored in IDrive account, which allow you to perform point-in-time recovery. They are useful especially in case your systems were attacked by ransomware or other malicious software. If your data is infected with encryption-based ransomware, all you need to do is select a time-line before the infection and restore it. As IDrive is cross-platform compatible you can ensure all your PCs and Macs are backed up and protected against these threats. The additional storage requirements for Snapshots has no impact on your IDrive account storage space. How far can I go back using Snapshots? Snapshots uses the versioning feature of IDrive behind the scenes. IDrive now supports up to 30** versions. The 'go back' period depends on the oldest version's time stamp. You can find the Snapshots feature under the Restore section in IDrive application. Easily restore a previous version of your backed up file by following these steps. Go to the 'Restore' tab and click 'Snapshots'. Select the date and time and click 'Submit'. A list of all the data backed up on or before the selected date appears. Select the required files/folders and click 'Restore Now'. * The Snapshots feature is supported for most accounts, starting 07/04/2017. **	Version limits have changed for IDrive. Currently, you can restore 30 versions of the backup up files. For accounts created prior to 11-07-2018, you can restore up to 10 versions. Perform point-in-time recovery of the data stored in your account. Restore files stored in your IDrive cloud account with ease. Manage backups and more, on your far-away computers via web console.